On the foothills of the Kimmerian Steppes near Lake Novagrad, where the people of the Rus have settled, there is a darkness which haunts their land. Legends speak of a ship of fire which created the great lake, and of the Norse God Ullr creating the Chain of Nod with his skis as he fled from some unnamed horror, the streams of the Chain which feed the lake from the tall mountains, but the fear that is whispered among the settlers within the hills and valleys is of a Stone Monolith that sits upon the last hill before the coming of the mountains near to a cavern of immense size and evil repute. This is the Black Monolith which is older than the settlement of the Rus, older than the Kimmerians, if such stories can be believed. Any of the old race of Hyperboreans will avow no knowledge of this stone, but neither will they journey nearer than the southern edge of Lake Novagrad and even then none will stay longer than it takes to complete what business they may have before moving on. 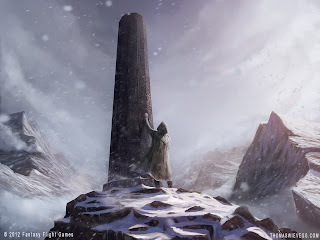 Anyone interested in a play-by-post adventure using the Astonishing Swordsmen and Sorcerors of Hyperborea setting should reply to this post and we can begin the adventure. I don't want to know what Ullr was fleeing from! Jason, should we scan and e-mail our characters(s) to you? Or just type the relevant info into a PM? Post to the board? I'd thought we'd run the game on the board and just ask other players not to look at the posts until we finish the game. I would ask you to email me your characters so I can print them. Do you want to pick out an illustration for your characters? I have to find my body wound sheets so you can keep track of scars and such. I've made three characters for now; a common man (with viking blood) female scout, a kimmeri-kelt shaman and a straight common man fighter. My thinking was starting out with the scout, but i could chance that if more players get involved. I have not spent any time time typing them up yet, essentially just jotting down the important details, but i will gladly type them up, find illustrations, and send them to Jason as soon as possible. I will bring mine to work tomorrow and scan on the printer that can handle 8.5 X 14 paper! I'll poke around for an illustration, though once you have the character, anything you suggest is fine, too. Perfect. On my part I need to start tracking down some illustrations, but even if I don't have them at the start we can get the game rolling. I want to find my map of the area which I'm hoping I scanned into my computer. Not to worry about that though because I will draw up a new one and add details as you explore (warning though, I'm not much of a map maker). When you get me your characters I can start going through some background and get the game going. Everyone will have their own thread and please don't peek at the other players threads. I have a big selection of pics on my computer and a giant box of illustrations cut from old gaming books and magazines I will check through. Jason, is this going to be a typical PbP game where the DM posts and sets a scene and the players then post their characters actions/interactions with that scene, then the DM posts in response to that and then the players post further actions/interactions, and so on and so forth? If so, I'm interested in playing. That is it exactly. I'm looking for players that can do at least twice a week and can make arrangements to be online at the same time I am when combat situations occur (so we can resolve them in a flurry of posts). I can handle players that post several times a day. Unless players can work out how to group together each player is involved, for the most part, in a separate game featuring the same scenario. If the chance for players to interact or cross each others paths occurs I will go for it, but in the past I found it impossible to manage multiple pbp players together unless we were all on and posting at the same time. Just arried. I love background. Please provide all that you like. I find it enriches the game and it lets me add spice to your individual adventure. "Forget all that you may have heard or read of Hyperborea," the half-blind wanderer said as the fires of the night painted his face with a shifting mask of flame. "You are called forth from the land of your ancestors. You are called forth from the land of your parents. You are called forth from the land of your children!" As he spoke he threw off his robes and the mask of flames rose high and he became as a giant clothed in fire. In his hand was a spear and all around was smoke, grey and black, choking till the darkness was in your eyes and behind your eyes. The morning sun wakes you and you find yourself waking beside the smouldering ruin of a great ring of fire. Snow crackles beneath you and the field of white seems to surround you in all directions. For a moment the sun blazes and your close, and in that blink the snow is gone, the cold breath of winter is past and the warm, damp earth of spring has appeared. You can smell a tang of water. Ahead of you is a great expanse with a small stone beach. A wheel-rutted road separates the field in which you lay from the stones. Beyond the waters north of the rising sun are the hint of mountains. The road turns from the east toward the north. Your adventure has begun. (Players please let me know [private message or email] which character you choose to run and we can begin the game). Man...does anybody miss this thread as much as I do? Any chance Jason will reboot it?